Are coal-mining deaths part of our ‘way of life’? February 20, 2013 by Ken Ward Jr.
Gov. 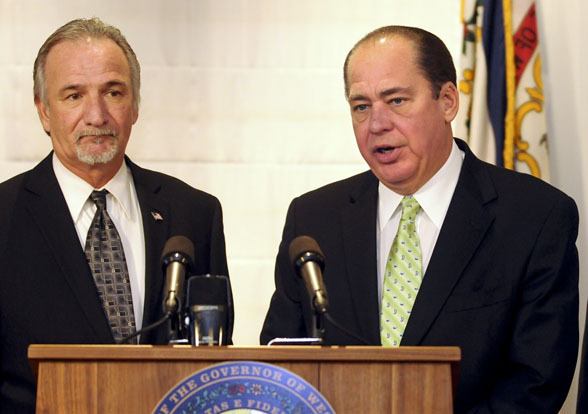 Earl Ray Tomblin and mine safety chief Eugene White answer questions from reporters during a press conference this morning at the Capitol. Citing a string of recent mining deaths, Gov. Earl Ray Tomblin today ordered all West Virginia coal operators to briefly halt production to review safety laws and best practices. The governor announced the “safety stand down” following the Tuesday night death of a Raleigh County miner who was run over by an underground mining “scoop” vehicle. It was the fourth coal-mining death in the last two weeks in West Virginia. You can read the governor’s prepared statement here and I’ve posted a copy of his executive order here. You can watch the entire press conference online here via WBOY-TV. There was a lot of hang-wringing at today’s press conference, as administration officials, state regulators and lobbyists for both the coal industry and coal miners contorted themselves to avoid saying anything too negative in the wake of four coal-mining deaths in just 14 days. I understand there just aren’t any explanations for these, as they do the preliminary investigations … We strive every day to not have any accidents and its disheartening any time you have one, especially a fatality. We’ve got to get a grip on what’s going on in the coal mines here. Something is going wrong and we have to find out why. Miners should not be dying. I know we can make these mines safe so our miners can come home to their families every night. We’ve lost too many miners in this state. This has got to stop. Today, four families were shaken by the unexpected but always present danger associated with mining. While we strive to ensure the safety of our coal miners, accidents do occur. Well, I think we all recognize that working especially underground, working in close quarters, you’ve got to depend on each other. You’ve got to be at the top of your game at all times. It’s one of those things that we’ve watched over the years and we’ve done everything that we possibly can to make sure that our mines are as safe as possible. That’s the reason that the inspectors are out on a regular basis making sure the mines are in compliance with all of the safety laws. The problem, of course, is that our state hasn’t done all that we possibly can to make sure our mines are as safe as possible, as our recent Gazette stories showed pretty clearly (see here, here, here and here). It’s also worth noting that two of the coal-mining deaths in West Virginia this year (see here and here) involved miners being hit by or run over by mobile underground equipment — the sorts of deaths that could be prevented if Gov. Tomblin and the Legislature had included a requirement for proximity detection devices in last year’s mine safety legislation. Also, remember that the “safety standown” ordered by Gov. Tomblin involves the state’s inspectors going out to help mine operators give safety talks to miners before each shift tonight and tomorrow, but doesn’t call for any immediate inspections or beefed up enforcement, or anything of the kind. West Virginia’s coal mining industry can thrive only if mining operations are conducted as safely as possible and in accordance with the mandatory health and safety laws and regulations aimed at preventing accidents. I’m asking all coal companies and their employees to take this safety check seriously- we need to do everything we can to ensure all of our coal miners are safe. This is not a shutdown of mining operations. We are working statewide with mining industry officials to ensure we are taking all necessary precautions. The six deaths that occurred over the last month are tragic and unacceptable, and MSHA will take whatever actions are necessary to ensure the safety and well-being of all our miners. Production before safety … Has generally been the reason for mining injuries & death … I doubt that we will see any difference this time. Rules were probably not followed & unfortunately some died. It is not our duty to die for coal!! Too many have already. Why are people still supporting it?? Why do you support an industry that kills so many?? For a paycheck?? Lives are worth less than a paycheck?? Let that sink in for a moment. There ARE other jobs and ways to make electricity that doesn’t put West Virginian lives at risk. Im glad my father didnt allow me to “carry on the family tradition”. He made me promise to never be a coal miner. He wanted better for me. Shouldnt we all want better for our children and not have to put their lives at risk?? Thanks for your comment … but go easy on the multiple exclamation points and question marks … one of each will make your point. 1. Production before safety is no longer the norm in the mining industry especially with the bigger companies. Alpha, Consol and all the large mining companies I have worked with really changed their focus to a safety first culture many years ago. Is it perfect….no and they would admit it. But, it is not because of a lack of effort on the part of the mining executives. 2. Although mining has always been considered a dangerous occupation, even in 2010 with the fatalities at UBB, mining was number 5 on “the most dangerous occupations in the US” after 1. fishing (which had a fatality rate 3 times the coal mining rate), 2. logging (double coal mining’s fatality rate), 3. airplane pilot and 4. farmers and ranchers. And just slightly behind coal miner was 6. roofer and 7. sanitation worker. So, does mining have to be dangerous. No, it doesn’t. Improvements can and are being made every day. I hope all miners go home safe today, tomorrow and beyond.